Physician personally performs all laser treatments. Get in touch today for an affordable Laser Hair Removal treatment! Thinking of laser hair removal in Toronto? Why go to a non-medical spa where you never even meet a physician? The Board Certified Laser Physicians at the Baywood Clinic are Toronto’s experts at Laser Hair removal. We personally perform thousands of treatments each year, using the latest, most powerful medical-grade lasers. We have the expertise to safely use the strongest laser settings for a safe, effective result in the minimal number of sessions. Laser Hair Removal is a procedure that halts the growth of hair for a long term solution to the problem of stubborn hair that won’t go away no matter how many times you visit the spa, shave, or pluck. The highly experienced Doctors at the Baywood Laser Clinic are happy to assist you in answering any questions you may have, and will work with you one-on-one, throughout the entire process, at our downtown Toronto medical office. Call the Baywood Clinic today at 416-515-0007, to schedule a consultation with one of our board certified physicians, and discover just how easy it can be to live a hair-free life. We have vast experience with all types of skin, and can help you say “goodbye” to the razors, tweezers and wax, once and for all. Avoid the sun 4-6 weeks before and after treatment or until your doctors confirms that it is safe to do.. You must avoid electrolysis, plucking or waxing hair for 6 weeks prior to treatment. Hair grows in cycles. The number of treatments required depends upon your skin color and coarseness of the hair. Laser hair removal requires multiple treatments, and success depends on body area, color of hair, and thickness, as well as skin type. No one can clear white, grey or blonde hair. On average most patients are happy with 5 to 7 treatment sessions. No one can or should guarantee complete perfection. Our experience and quality lasers do ensure you get the best possible result. Within several minutes of the treatment, the treated area may become slightly red and puffy. This reaction subsides, and within a few hours the area returns to normal. Very rarely there might be some temporary darkening of the skin, which is treated with bleaching creams, or small blisters that resolve over a few days. Why choose the Baywood Clinic for your Laser Hair Removal? We were among the first medical clinics to start using lasers for hair removal and have been treating patients since 2001. We have worked with multiple lasers systems, and on every skin type. Being in Toronto means we have seen patients of every ethnicity – Asian and darker skin types – and treated hundreds every year. Our Clinic has a Certified Laser Safety Officer in order to ensure that the lasers and facilities meet the standards required by the Department of Consumer of Affairs. Ask if any clinic you visit has a Safety Officer. It might seem like a simple procedure, and it should be, but laser hair removal involves a mild burn to the deeper lasers of the skin, as the hair follicles are destroyed. Complications should be very rare, and our rate is close to zero, but we see complications on patients treated at other clinics every month. It is your skin – it’s important that you receive the safest, most experienced laser hair removal treatment possible. Our rates are among the lowest you will find for legitimate, experienced laser hair removal in Toronto. If you shop around, be wary of putting price as your most important priority. We see hundreds of patients who have been disappointed by super coupon “deals”, finding out after a year that their hair grew back, or that there were endless delays in getting appointments. We do not do packages – the goal of the salespeople who sell them is typically to ensure that you buy additional packages. We do not want to hold you to any sort of financial contract. If, for any reason, you decide not to continue your laser hair removal treatments, we are not holding any of your hard-earned money. You simply pay for each session as you go. We happily take Master Card, Visa, Debit, and Cash. We do offer discounts if you decide to do multiple areas. Just ask! Every individual patient is different – the amount of hair present in any bodily location can vary. So, it is always best to visit for your free, no-pressure consultation with the Doctor. For example, if you only have back hair in a small area in the upper should per area, the price will be less than for a patient whose entire back requires lasering. Over the last 20 years, we have tried multiple systems for laser hair removal in Toronto. We have found that the most reliable and cost-effective for our patients is the Candela 755 nm long-pulse Alexandrite – the GentleLase. In addition, it has a built-in safety and comfort feature called the Dynamic Cooling Device (DCD), which sprays a cooling cryogenic spray onto the skin just milliseconds before the laser fires. This makes the treatment more comfortable and protects the surface of the skin from damage. Laser Hair removal is one of the most popular cosmetic treatments in the world – millions of both men and women seek a permanent result to the nuisance and time-consuming alternatives of shaving, tweezing, and waxing. Lasers selectively target dark, thick hairs but leave the surrounding skin undamaged. Generally thicker hairs are removed in early sessions, while finer hairs respond later. White, gray or blond hair cannot be removed. 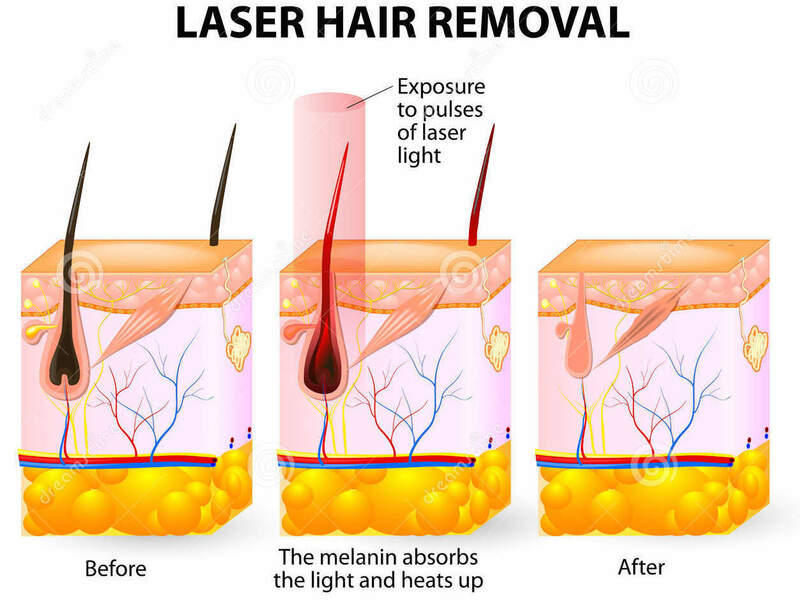 Removal with our laser is permanent, the hair never grows back. No on can absolutely guarantee 100% total clearance, but our laser can and often does succeed in ridding you of all the hair in an area. Different areas and skin types respond differently – male back hair, for example, typically requires more sessions than female underarms. Unwanted hair can be removed from any location, the face, ears, hands, legs, arms, underarms, the bikini line, and more. The GentleLase uses up to a 20 mm spot size and can fire a laser pulse every second or faster. Every pulse lasts 3 milliseconds, or 3/1000’s of a second. Each pulse targets multiple hairs, and every pulse covers an area the size of a quarter. So, the lip can be lasered in just a fees seconds – the back and legs take up to 30 minutes. If you are considering laser hair removal in Toronto, our clinic offers consultations and treatment by a licensed physician. It’s your skin, why not trust an expert? If you are thinking about laser hair removal, try to find a doctor who has extensive experience with laser hair removal. If a registered nurse performs the procedure, ask which doctor supervises and will be available on-site during or after the treatments in the event of a complication. Be careful if you are thinking of a spa, hair- salons or any other location in which nonmedical technicians perform the laser hair removal. Before you begin your laser hair removal at our clinic in Toronto, you will see the Doctor for a complimentary consultation. During this visit, the most important goals are to ensure that you are a good candidate. We want our patients to be happy, and never upsell or recommend treatment of any sort if we are not confident that you have an excellent chance for good results. You will be able to ask all the questions about laser hair removal you like, and we encourage you to go home and think about it or visit other clinics so that you can compare. The doctor will also review your medical history, medications, any history of skin disorders or issues with scarring, and any experiences you may have had with hair removal procedures in the past. It is important to rule out conditions like Poly Cystic Ovarian Disease, which may be contributing to hair growth. The Doctor will then discuss all the potential risks of laser hair removal as well as the expected benefits, including an honest opinion, based on tens of thousands of treatment s about what laser hair removal can or cannot achieve for you. We then take confidential photos for the charts, that can’t be used to review your progress. Finally, at the end of your consultation the doctor will discuss a treatment plan and the costs. How to prepare for Laser Hair Removal treatments. Staying out of the sun. Follow your doctor’s advice for avoiding sun exposure, usually up to six weeks before treatment, and use a broad-spectrum sunscreen daily. If you will be starting your laser hair removal in the next 4 weeks, please limit plucking, waxing, and stop any electrolysis. The laser targets and destroys the hair roots, and these are removed temporarily by any of the previous processes. Try to avoid any sun exposure for about six weeks before and after treatment, since this can make laser hair removal less effective. A tan also means that the melanocytes in the skin are darker and compete for the laser, which makes complications after treatment more likely. Therefore, in darker skin types the doctor uses less energy. Shave the areas that are going to be lasered before you arrive or arrive early enough so that we can shave the areas for you. This is important since the laser cannot penetrate hair and will burn it. What to Expect During Laser Hair Removal at our Toronto Clinic? Both the Doctor and you will wear eye protection. We are often amazed when patients tell us that they were treated at a spa and only used the cheap, plastic goggles, sometimes with the centers made of clear plastic, that you find in a tanning salon. Lasers are powerful! You must always wear special titanium goggles until the doctor tells you to remove them. The doctor will press the hand-held laser distance gauge to your skin. At each session, a few test spots are fired to ensure that the reaction is appropriate and that you are comfortable. Some patients prefer to prepare by using Maxilene cream, which is a very strong topical anesthetic. Most patients find the treatment reasonably comfortable, often comparing the laser pulses to the snapping of elastic bands, sparks, or tiny splashes of oil that last only a split second. 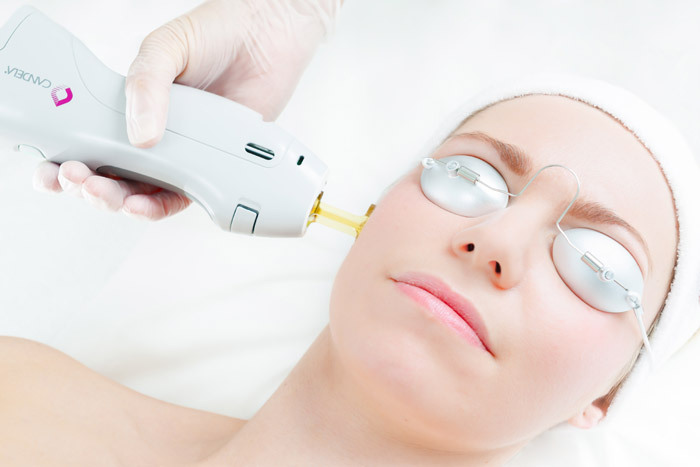 The laser beam passes right through your skin and hits the hair follicles, where the intense heat destroys the blood supply and the hair follicles die. After your session is complete, you might be given ice packs, or some steroid creams or lotions to prevent any swelling. Laser hair removal usually requires a series of six to eight sessions, though that varies between individuals and between areas of the body. Typically, you should return between 4-6 weeks for sessions, although for large body parts like the legs and back, we sometimes wait 8-12 weeks or until the hair stats to regrow. One week after your session you may see what looks like new regrowth but is just the dead hair shafts slowly rising to the surface and falling out of the skin. Hair grows in several phases called anagen, telogen, and catagen. Lasers can only destroy the active growing hair follicles in early anagenic phase. Therefore, you need several sessions to damage hair in all its phases of growth, so that it becomes an inert and non-growing. For a couple of hours, up to possibly 48 hours, afterwards, the treated area of your skin might feel and look like a mild sunburn. Cool ice compresses and and steroid creams may help if you are uncomfortable, but usually less than 5% of patients have any problem after a few hours. You can wear makeup within 24 hours is necessary, but again, many patients apply it before leaving the clinic. Over the next few weeks, the treated hair falls out. Wear sunscreen for the following 4 – 6 weeks to prevent any temporary color changes in your skin. Blisters are extremely rare (less than 1%) but can occur in people with darker skin types. Other potential complications are mild swelling, redness, and very, very rarely scarring. We have never had a case of scarring in 20 years and over 50,000 sessions. Side effects can vary with skin type, hair color and thickness and how well any pre-treatment plan and post-treatment care plan are followed. Skin irritation. Mild, temporary discomfort, and some redness or swelling can occur immediately after your laser hair removal session, but typically resolve within a few hours. Pigmentary changes such as lightening or darkening of the skin are quite uncommon, but can occur. Darkening or hyperpigmentation usually occurs after several session in very small spots and is easily treated with bleaching creams. Lightening or hypopigmentation is very rare and usually temporary in darker skin types when there is pre-treatment sun exposure. Very rarely, laser hair removal causes blistering or crusting or some other changes in skin texture. Laser hair removal should never be performed on eyelids and eyebrows, because of possible eye injury. Questions about Laser Hair Removal Prices in Toronto or anything else? Our doctors are always happy to answer any questions you may have about Toronto Laser Hair Removal. Before, during or after your treatments, never hesitate to email or call us. Our goal is to make sure you have a successful hair removal experience, so that you feel confident in our Clinic and comfortable referring your friends and family to us. See you Soon!